I learned how to make tomatillo salsa when I was a community supported agriculture (CSA) member and receiving weekly boxes of fresh fruits and vegetable from a local farm here in the Pacific Northwest. I remember discovering a large bag of tomatillos in my box and not knowing what to do with them. I was familiar with salsa verde and set out to find a recipe. 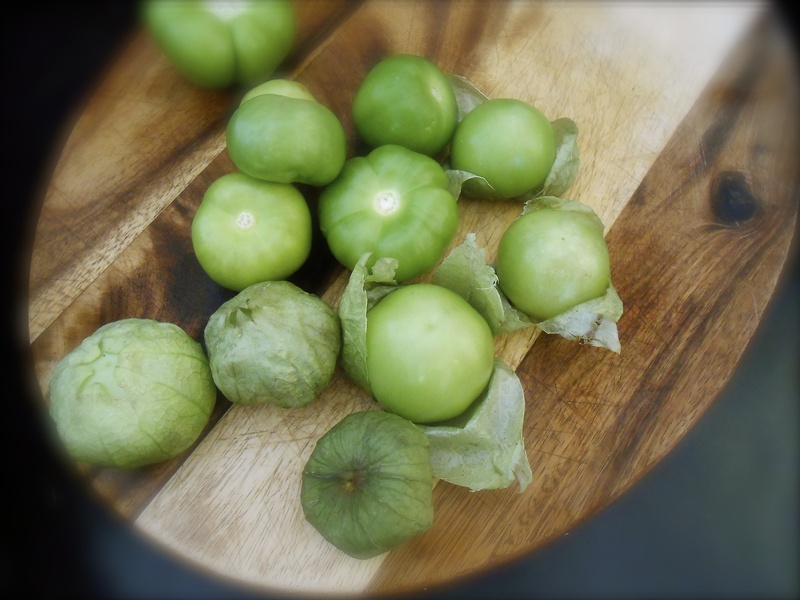 By definition a tomatillo is a small green fruit, similar to a tomato, with a paper-like husk. They are very tart in flavor and aside from salsa verde I have not experimented with them. 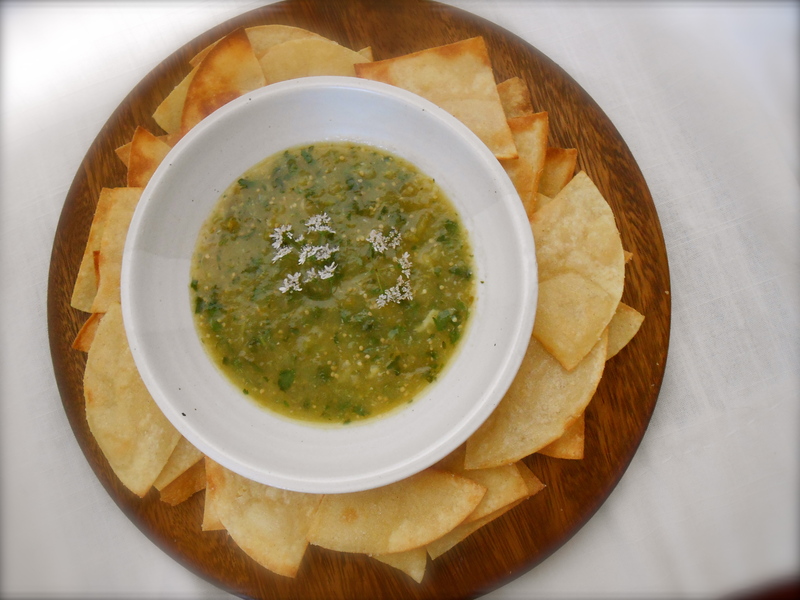 This is a wonderful salsa served warm with freshly made tortilla chips. 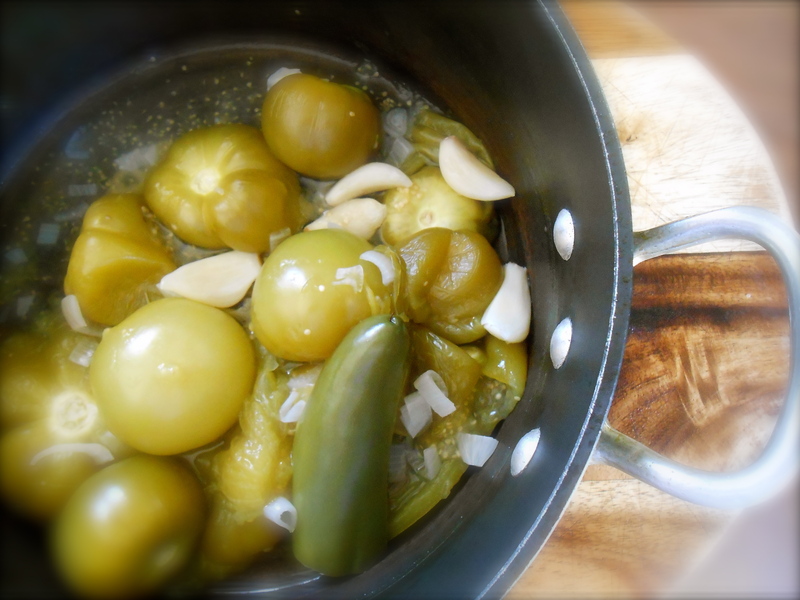 Remove the papery skins off of a pound of tomatillo (roughly 10 tomatillos). Place them (whole) in a saucepan and cover with water. Add one roughly chopped shallot, two large jalapeños (depending on your machismo) and five whole cloves of garlic. Boil until very tender, about 7-10 minutes. Drain out all but one cup of water and return to the pan. Blend into a salsa consistency using a hand blender. You may use a blender if you do not have a hand blender. If you are using a blender start slow so the hot liquid does not splash on you. Puree until mostly smooth. Add a handful of cilantro and a pinch of sea salt. Transfer to a serving bowl. Finely chop another shallot and add to the bowl of salsa. Stir to incorporate. We like to eat this salsa warm, but it also keeps in the fridge. Served with fresh homemade tortilla chips. Heat a good amount of olive oil in a non stick skillet over medium high. Cut your tortilla’s into desired shape, fry until crisp, using tongs to turn. Remove to paper towel, salt and let them cool. Transfer to your serving basket or bowl. Serves several as an appetizer. This sauce sounds amazing! Love that you added in the jalapeno for the extra spicy effect! Also, love love homemade tortilla chips! I make mine in the oven though, but either way, fried or baked, they’re still so good! Next time I make them…I’ll bake them! I really like the olive oil flavor that is present with the frying…I don’t really like the idea of eating too much “fried” food though. Are you able to have such a salsa in Argentina? Salsa Verde? Hmm… nope I’ve never seen salsa verde here. We have a spicy sauce called chimichurri that is used on meats, or another sauce called salsa criolla (made of chopped onions, tomatoes, red bell peppers & olive oil). I like both sauces, but to go with tortilla chips, I like salsa criolla better. I am familiar with chimichurri! I actually make chimichurri often. I suppose salsa is indigenous to Mexico. Nice to hear from you this morning Felicia! :) Good day and weekend too! I actually just put it all in the blender raw. It’s still good, but not as good as I imagine letting all the juices and oils stew together would be. I make my habanero hot sauce the way you make your tomatillo. I defer to your method on this one. Thanks. They’re very good raw too. They have a cool consistency. Enjoy! What a great recipe. I will add this to my recipe collection. Homemade chips always taste better. The salsa has a nice tang and a bit of heat on it. It is so delicious served warm with your chips. Thank you Suzie. I’m going to check it out now. I’ll have to try it “raw” too. You are a gem of a Blogger and great Foodie! I love your blog so~ much! Aww. Thank you so much Fae. You just made my evening! I am just now reading your blog and Tastytreat13’s Lemon Curd Marbled Cheesecake guest post! Wonderful! Oh my goodness. So mouthwatering to look at and even think of! What an interesting, simple and straightforward recipe. I would love to try it, If I can find tomatillos. What is the best substitute if I can’t lay my hands on tomatillos? please let me know. Thanks for sharing. I love easy life and this is easy! I had seen tomatillos all around New York but it wasn’t until earlier this year that I actually bought some and ate them and was floored by the lovely flavor. Not sure if they’re still around in the markets here but if I find some I’d love to try your salsa recipe (sans jalapeno though I’m afraid) which sounds very refreshing and a perfect summer dip. This sounds so good, love tomatillo’s. I think this sounds great, would love it with a nice cold beer!! Yes. A nice cold beer would be perfect with this. I tried tomatillos for the first time this summer too. Definitely tart! I wish I had used them for this recipe! Tomatillos are like hens teeth in Oz, I’ll just have to imagine hoe good this must be! haha! I did read a green tomato could sub as an alternative. Aren’t green tomatoes tart? I’m not sure…but I may try it just to see. Are you still traveling? Still travelling for another couple of months. Have been without telecommunication for last 3 weeks, doing catch up now. Yes I I think green tomatoes would make a great substitute! Aren’t tomatillos interesting? I read somewhere they are part of the gooseberry family! And they grow in a paper husk! They are very delicious. You are right. It was gone in seconds and there was only two of us eating it! :) Such a great dip. Look for them at the grocery and try it! I love tomatillos so much so this is all kinds of perfection in my eyes! Thank you Pamela. They are so good, unique and delicious. Next time I may try them in a raw tomatillo salsa. I am impressed! You made your own tortillas!! Although I always tell myself that I will make my own, I get lazy and buy them instead. I love tomatillos and one day I’ll have to share how I use tomatillos. Oh please do share how you use tomatillos, I’m so curious! You are currently reading fresh made tortilla chips and tomatillo salsa at COTTAGE GROVE HOUSE.